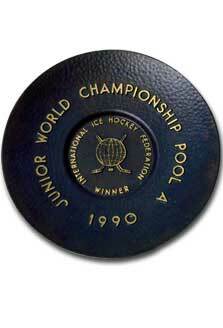 This premier junior hockey event has been held annually by the International Ice Hockey Federation (IIHF) since 1977. In the tournament's formative years, eight nations competed for top honours with two in particular dominating the gold medal haul, namely Canada and the former Soviet Union. In fact, the Soviets won seven of the first 10 titles and the Canadians winning seven times in the 1990s. The IIHF presents their Championship plate to the winning team after the gold medal game. Each year a new plate is awarded to the victors, thus allowing the winning nation to keep, preserve and showcase their achievement.